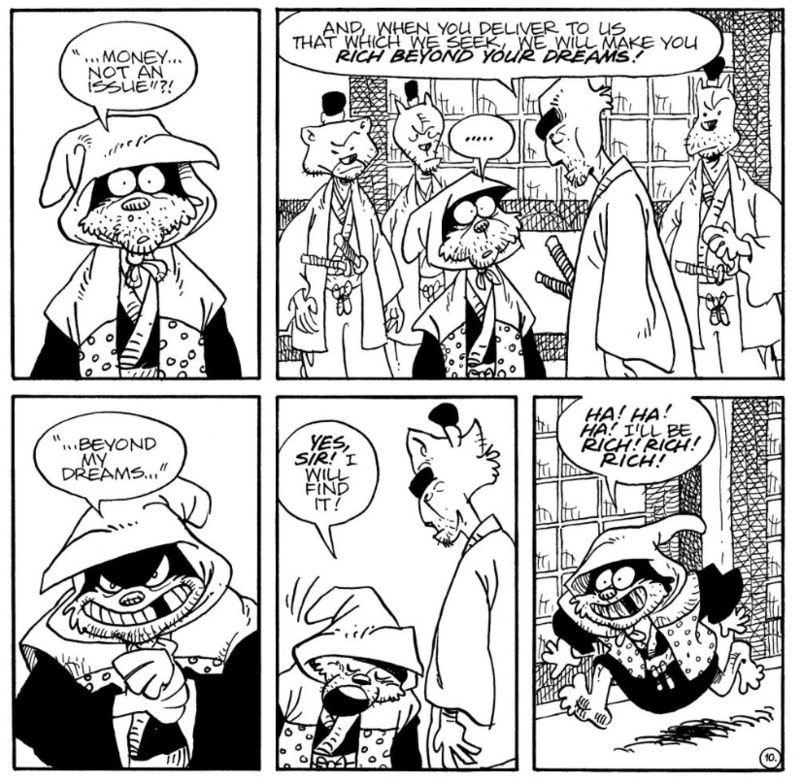 Usagi Yojimbo: The Hidden 5 is a great reminder of how the comics medium can be/should be very intentional with its imagery. In film the term “match cut” refers to a transition where two shots are paralleled (matched) by their action or subject matter. 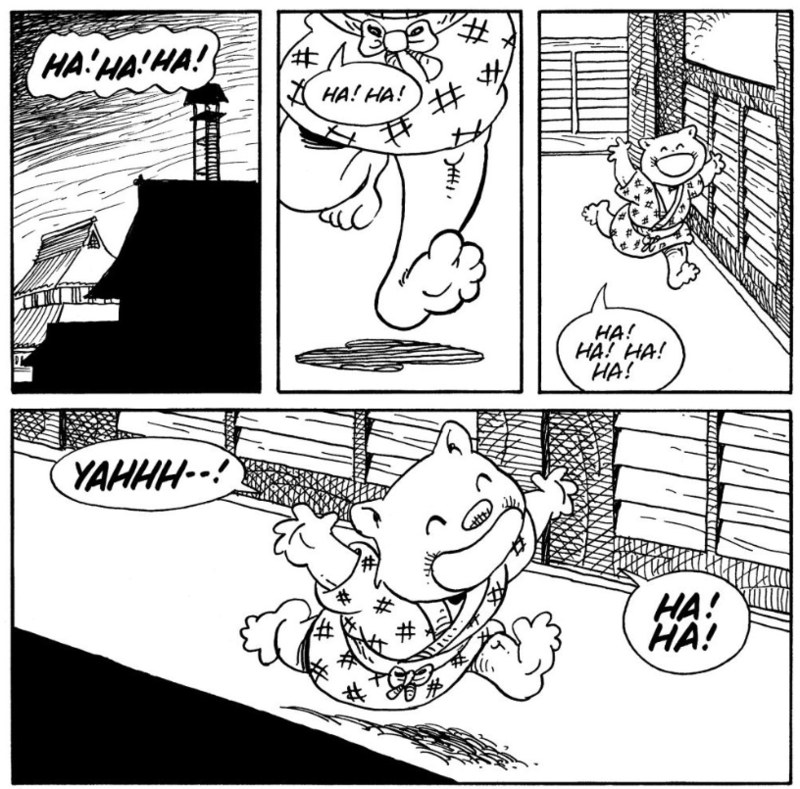 Stan Sakai uses this technique in the middle of Usagi Yojimbo: The Hidden 5 to reiterate the kind of villains that Usagi is dealing with. Usagi and Inspector Ishida have been closing in on the mystery behind the recent Christian murders. While the criminals have managed to stay a couple of steps ahead, they have also been typified as cagey, money-desperate loons – at least the thieving middlemen. Such is the case for the “broker” that the Shogunate have hired to do their dirty work. Ishida’s child Haruko screams with gleeful laughter as he is runs down the hallway, preparing to pounce on a sleeping Usagi. This transition is a simple but effective way to illustrate that the criminals we are dealing with are far from masterminds. If the criminals are to be thought of as little more than devious, disobedient children then it’s practically a foregone conclusion that the adults will catch them in the end.